Welders and related machine operators operate welding equipment to weld ferrous and non-ferrous metals. 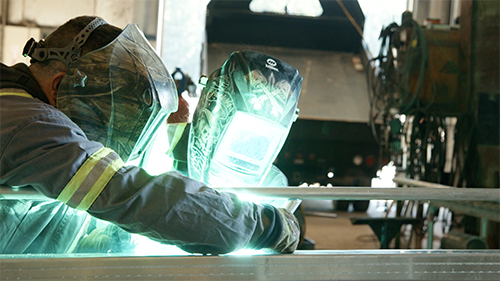 A welder can be either an artisan or a precision production worker. This group also includes machine operators who operate previously set up production welding, brazing and soldering equipment. The great variety of work, techniques and work settings offered by this occupation may be appealing to those seeking variety in their day-to-day activities. Welders may specialize in particular types of welding, such as custom fabrication, ship building and repair, aerospace precision welding, pressure vessel welding, pipeline construction welding, structural construction welding, or machinery and equipment repair welding. Most welders and related machine operators work 40 hours per week in factories and machine shops and on construction sites. Those working at mills, factories and processing plants may work nights and weekends, or do shift work. Machine welders almost always work in controlled factory environments. Those working in manufacturing may work at sawmills, pulp and paper mills or mines. The Oil and Gas industry hires welders to work on oil and gas rigs and pipelines. Welders and related machine operators who work in Construction or in the Oil and Gas industry often work outdoors in various weather conditions. They may also be required to work from scaffolds or platforms. Other potential hazards to welders include exposure to fumes, intense light and burns, so they take safety precautions to avoid injury. Welders in the Construction industry often relocate to different job sites, sometimes in remote regions. Short periods of unemployment between projects are also common. Completion of secondary school is typically required. Welders do not need trade certification to work as a welder in B.C. However, there are three levels of welder certification available in B.C. : levels C, B and A. Level C certification is a prerequisite for level B certification, which is a prerequisite for level A certification. Each certification level may be completed in a modular format or through a formal apprenticeship. The modular format requires more in-school training than the apprenticeship format for all levels of certification. Each level takes one year to complete and requires a mix of documented training and work experience. Apprenticeships can be started in secondary school, through entry-level training at colleges and technical institutes, or by direct entry, where workers find a sponsor employer who is willing to participate in the program. For more information, see the Industry Training Authority website at www.itabc.ca. Interprovincial Red Seal Certification is available for welder levels B and A. Those who complete level C will receive an Industry Training Authority Certificate of Qualification. Levels C, B and A may be challenged with 2,700, 5,400 and 7,020 hours, respectively, of documented directly related work experience. Level C certification is required before challenging level B certification. Applicants for challenge tests must pass both a written and practical examination. Technological improvements, such as increased automation, are leading to productivity improvements. Increased worker output will decrease the number of new jobs created. However, technological improvements should increase the demand for highly skilled welding machine setters and operators. Welders on construction projects and those who repair equipment will not be affected by technological changes to the same extent as those in the Manufacturing industry because their jobs are not easily automated. Construction-related manufacturing, such as architectural and structural metal fabrication, will likely offer the greatest demand for welders and related machine operators over the next few years. However, the phasing out of older saw and pulp mills and increased use of automation within the remaining mills will limit employment opportunities for welders and related machine operators in the wood product manufacturing sector. With experience and additional training, welders can move into more senior positions. These include supervisory roles such as welding inspector, foreman or supervisor. They may also transfer their skills to related trades like boilermaking. Some experienced workers may also become self-employed and work as a contractors or open their own repair shops.